Omega Speedmaster Limited Edition "Ultraman"
The Omega Speedmaster Professional was the first watch on the Moon and therefore enjoys its iconic status as the Moonwatch. It remains one of the most famous chronographs in the world and is still used by NASA for their manned space missions. "That's one small step for man, one giant leap for mankind." It's a quote known the world over. Neil Armstrong spoke these famous words on July 20, 1969, as he became the first person to ever set foot on the Moon. He was soon joined by Buzz Aldrin, who hopped across the lunar surface with an Omega Speedmaster Professional on his wrist. Originally designed for motorsports, this chronograph had now transformed into the legendary Moonwatch. Omega still offers a version of the Speedmaster Professional that is almost identical to the original Moonwatch from 1969. The case size, crystal, and even the movement all remain largely unchanged. However, it is now also available with automatic movements and moon phase displays. The Speedmaster Automatic Holy Grail with the reference number 376.0822 is a coveted and very rare example of a vintage automatic Speedmaster. This Biel-based manufacturer releases a new, limited edition version of the Speedmaster every year. They are often limited to a few thousand examples and are perfect for watch collectors and fans. Some of these models even make good investments, such as the Omega Snoopy. Prices for these uncommon and desirable timepieces have risen considerably in the last few years. How much does an Omega Speedmaster Professional cost? No other watch combines a legend with functional technology like the "Speedy." If you decide on a Speedmaster Professional, you'll be purchasing a watch with a unique history. Moreover, it's one of the most beloved watches there is among watch enthusiasts and collectors. It also has impressive technical features: Its chronograph function works like a stopwatch, and the tachymeter scale on the fixed bezel helps you determine average speed. Die-hard Speedy fans prefer the Hesalite version of the watch. Hesalite is what Omega calls plexiglass. The original Speedmasters from the 1960s used this material as it is affordable, easy to replace, and doesn't shatter, which NASA required due to safety concerns. The Hesalite version is still produced today; you can find it under reference number 311.30.42.30.01.005. This Moonwatch variant is closest to the watch from the 1960s and costs around 3,700 USD new. Pre-owned examples cost a few hundred dollars less. In terms of the movements, it's important to note the difference between the 1861 and the 1863. While they are identical in technical terms, the 1863 is more ornately decorated. Therefore, models powered by this movement have a transparent case back so you can admire its beauty in action. The Omega Speedmaster Professional with the reference number 311.30.42.30.01.006 features one of these sapphire glass case backs in addition to the sapphire glass already protecting the dial. This material is much more scratch resistant than Hesalite, though it is also significantly more expensive to replace should the need arise. Plan to spend about 4,300 USD on an example in mint condition, which makes the sapphire glass version only a few hundred dollars more expensive than the one with plexiglass. Pre-owned watches sell for around 4,000 USD. With a case diameter of 42 mm, the Moonwatch is certainly an impressive sight. A smaller alternative is the Speedmaster Reduced. Omega produced this watch from 1988 to 2012. Its design is very similar to that of the Professional. However, thanks to its smaller 39-mm case, it complements thinner wrists. A well-maintained model can cost around 2,000 USD. Two variants of the Speedmaster Professional feature a moon phase indicator. The version with the usual 42-mm case and reference number 3876.50.31 costs around 3,900 USD new. The larger version has a diameter of 44.25 mm and can be identified by its reference number, 311.33.44.32.01.001. The in-house caliber 9904, an anti-magnetic Omega Co-Axial Master Chronometer, ticks away inside this timepiece. If you're interested in this chronograph with a moon phase display, be prepared to spend about 8,000 USD for a mint-condition timepiece or 7,000 USD for a pre-owned example. This Omega Speedmaster Professional Moonwatch is also available in ceramic or gold. If you're on the hunt for an original Speedmaster Professional from the time of the Apollo missions, then you should keep an eye out for the reference numbers 105.012 and 145.012 . Astronaut Buzz Aldrin wore a 105.012 as he took his first steps on the Moon on July 20, 1969, while his colleague Michael Collins wore a 145.012. Neil Armstrong left his Speedmaster on board the lunar module, which had a broken on-board clock. A 105.012 from the mid-1960s is rare. Its value largely depends on its condition and if the accompanying box and papers are still available. Prices for both models sit well above that of a new Speedmaster Professional. A ref. 145.012 demands a solid 9,100 USD, while you'll need about 12,900 USD to purchase the Omega Speedmaster Professional Moonwatch ref. 105.012. The transition from reference number 145.012 to 145.022 marks the change from the caliber 321 to the 861. According to Omega, caliber 861 is more robust. You can buy a pre-owned Speedmaster Professional 145.022 for around 6,100 USD, making it significantly more affordable than its predecessors. As long as you find its functionality more important than its value as a collector's item, the 145.022 is a good choice for you. It also has potential to increase in value. Omega produced watches with the 861 movement until 1997. Omega regularly releases limited editions of the Speedmaster Professional Moonwatch. These often make for a good investment, since their prices tend to rise over the years thanks to their limited numbers. One example is the Snoopy, which first appeared in 2003. This timepiece pays homage to the Apollo 13 mission. The 2003 edition features a black dial and is limited to a run of 5,441 pieces. Be sure to set aside around 11,100 USD for a pre-owned version. The second 'Snoopy' watch came out in 2015 and had a white dial. Only 1,970 copies of the Omega Speedmaster Professional Silver Snoopy Award were ever made, making them much harder to come by. Prices for models in mint condition regularly come in at over 19,900 USD. Pre-owned Snoopy watches sell for around 16,400 USD. At release, the official list price sat at 7,350 USD. The platinum Omega Speedmaster Professional Moonwatch Apollo 11 40th Anniversary is extremely rare, with a limited run of 69 watches. A solid gold case back and medallion at 9 o'clock characterize this timepiece. Both the case back and medallion also feature the logo of the Apollo 11 mission – an eagle landing on the Moon. At 78,300 USD, it is one of the most expensive Speedmaster watches. However, considering the original list price of 135,000 USD, this platinum watch is almost a bargain today. If 78,300 USD isn't quite within your budget, you may find the stainless steel version of the Speedmaster Professional Apollo 11 40th Anniversary interesting. This timepiece is much heavier than the platinum edition and comes with a silver medallion. 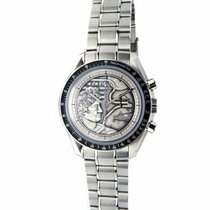 The same Apollo 11 logo embellishes the medallion at 9 o'clock and the stainless steel case back. Since 7,969 copies of this timepiece exist, it is much more affordable. Make sure you have about 5,300 USD on hand for this Speedmaster. In the last few years, this price has remained stable. The Speedmaster Professional Moonwatch Speedy Tuesday is yet another coveted model. Omega introduced the first edition of this timepiece in 2017 in honor of #speedytuesday. Before that, Speedmaster fans around the world had already been tagging posts of their Omega chronographs and their stories with this hashtag. The Biel-based manufacturer released the second edition of the Speedy Tuesday in 2018 under the nickname 'Ultraman.' 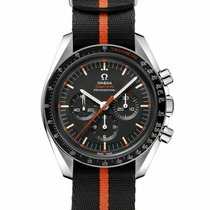 It celebrates the Ultraman Speedmaster from 1968 and, therefore, includes colorful orange accents. Both models are limited to runs of 2,012 pieces, meaning they are relatively rare. It took only a few months for the price of the 2017 model with a reverse panda dial to skyrocket. What had cost 6,500 USD upon release cost 9,700 USD by mid-2017. Since then, the price has fallen slightly to about 9,100 USD. Pre-owned watches in very good condition are a few hundred dollars more affordable. The Speedy Tuesday 2 Ultraman is expected to increase in price in the near future. It first entered the market listed at 7,100 USD. You can recognize its vintage predecessor from 1968 by its orange stop-seconds hand and the reference number 145.012-67. This chronograph is equally difficult to find and demands prices of around 11,700 USD in good condition. If you'd like a more colorful Professional, then look for a watch with reference number 311.30.42.30.01.004. While most Speedmaster models normally keep it subtle with a dark color palette, this watch truly pops. It has a red and white checkered dial edge with a special story behind it. The watch earned the nickname Tintin after the comic book hero created by the Belgian cartoonist Hergé. In the issue 'Destination Moon' from 1953, a red and white checkered rocket plays an important role. The rocket's checkered pattern inspired this unusual Speedmaster Professional's design. If you decide on this watch, you'll have another interesting origin story to tell in addition to all the others already surrounding the Speedy. The Speedmaster Tintin is also rare since Omega no longer produces it. Even so, it barely costs more than the standard model: You can find mint-condition pieces for just 5,300 USD. However, it is possible that these prices will climb in coming years. The remarkable story of the Omega Speedmaster Professional began in the fall of 1964 when NASA commenced their watch selection process. While the rest of the astronauts' equipment was being specially made, NASA decided to use commercial watches. They put watches from various manufacturers to the test, subjecting them to temperatures as high as 93°C (200°F) and as low as -18ºC (0°F). Furthermore, the watches were made to endure conditions with 95% humidity, violent shocks, vibrations, and high pressure, as well as vacuum pressure. 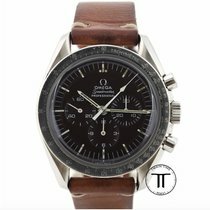 The Omega Speedmaster was the only watch to pass every test, and in early March 1965, NASA decided to use it as their official timepiece for manned missions. The astronauts of the Gemini 3 mission wore the watch during their flight on March 23, 1965. Around two months later, Edward White wore a Speedmaster Professional during his spacewalk. The watch functioned perfectly even in the unusual conditions of space. Omega added "Professional" to the Speedmaster's title after receiving NASA certification in 1965, four years before the Moon landing. Yet the watch had already made its space premiere in 1962 when astronaut Walter Schirra took his own Speedmaster along on the Mercury-Atlas 8 mission, which orbited the Earth six times. The 1962 version of the Speedmaster was a chronograph with three subdials. The small seconds dial was at 9 o'clock, and the hour and minute counter subdials were at 3 and 6 o'clock, respectively. Not much has changed since then; the stainless steel case, black dial with white accents, and tachymeter bezel all remain key to the Speedmaster's design. A push-piece on each side of the crown controls the stopwatch function. A long, textile strap suitable for spacesuits replaced the traditional leather or stainless steel band. Neil Armstrong was the first man to set foot on the Moon on July 20, 1969. However, because the clock on board had failed, he left his Speedmaster behind as a replacement and took his historic step on the Moon's surface without a watch. About fifteen minutes later, fellow astronaut Buzz Aldrin took his first steps on the Moon with his Speedmaster on his wrist. Alrdin sent his watch to the National Air and Space Museum in Washington, D.C. in 1971, but the package never arrived and it has been missing ever since. The Speedmasters belonging to the other Apollo 11 astronauts, Neil Armstrong and Mike Collins, are on display at the museum. The Apollo 13 mission was plagued by bad luck. However, it provided the Speedmaster with its first opportunity to shine, even if only for 14 seconds. After an oxygen tank exploded, the astronauts were forced to cancel their planned Moon landing. Commander Jim Lovell reported the incident with the now-famous phrase, "Houston, we've had a problem." From that point on, the mission's goal was to return to Earth safely. In order to do so, the astronauts had to right their course and burn their rockets for exactly 14 seconds. Astronaut Jack Swigert used his Speedmaster to time the 14 seconds, and the maneuver worked. If it had failed, Apollo 13 would have missed the Earth by about 60,000 km and disappeared into the vastness of space. For its role in saving the Apollo 13 astronauts, the Speedmaster Professional was awarded the Silver Snoopy Award. This award is the highest honor given by NASA for achievements related to flight safety or mission success. The 1995 Hollywood adaptation of the story elevated the Speedmaster Professional's reputation even further. After shooting finished, the lead actor, Tom Hanks, was a dedicated Speedy wearer. In honor of the watch's role in the Apollo 13 mission, Omega introduced two special limited edition models featuring Snoopy on the dial and case back. The end of the Apollo flights in 1972 didn't mean the end of the Speedmaster Professional as an astronaut's watch, however, as it was also used on space shuttle flights. Both the inside and outside of the Speedmaster have stayed nearly the same since the days of the Apollo missions. Omega uses the manual calibers 1861 and 1863 for the Speedmaster models. The movements have a 48-hour power reserve and vibrate at 21,600 alternations per hour (A/h). It had previously only had a frequency of 18,000 A/h until the calibers were reworked in 1968. Then the caliber 321 gave way to the 861, which has been continued as the 1861 since 1997. The modern version of the Moonwatch has its case diameter in its name: the Speedmaster Professional 42 mm. It is waterproof to 50 m (165 ft, 5 bar) and thus can also accompany you while swimming, as long as you aren't waterskiing or diving off any 10-meter diving boards. Although the Speedmaster Professional is the most prominent space watch, Omega does have a bit of competition. In May 1962, astronaut Scott Carpenter orbited the Earth three times with the Breitling Navitimer, making it the first chronograph wristwatch in space. The Speedmaster fell short of claiming this title by only a few months when a Speedmaster ref. CK2998 flew into space in October of the same year. It was the personal wristwatch of American astronaut Walter Schirra, who orbited the Earth six times in the Sigma 7 space capsule. Today there is a new edition of the "First Omega in Space." The stainless steel version of this chronograph bears the reference number 311.32.40.30.01.001 and costs around 3,800 USD. The Russian space agency also appreciated high-quality Swiss watchmaking: They relied on the Official Cosmonauts Chronograph made by Fortis. Breitling's Navitimer is one of the most well-known pilot's watches, and Fortis is one of the most prominent manufacturers of space and pilot's watches. The Speedmaster, however, doesn't have its origins in aviation but rather in motorsport. It first debuted in 1957 as a chronograph designed for timing laps.